This is a very beautiful mobile home built in 2004. It has 3 bedrooms and 2 baths and is 1, 680 Sqft in an extra large lot. It has a fireplace, family room, wet bar, a large living room that continues to the dining room that features a serving bar. the kitchen has a custom built cabinets with lots of storage, and has an island, skylight, pantry, eating bar, The adjacent Family Room has a FIREPLACE, the large master bedroom has a walk-in closet and a Master Bath with a soaking bathtub, separate shower, counter space, and storage. A laundry room, The front door opens out to a beautifully tiled covered deck, and the back sliding glass doors open to a tiled and covered carport with a misting system. 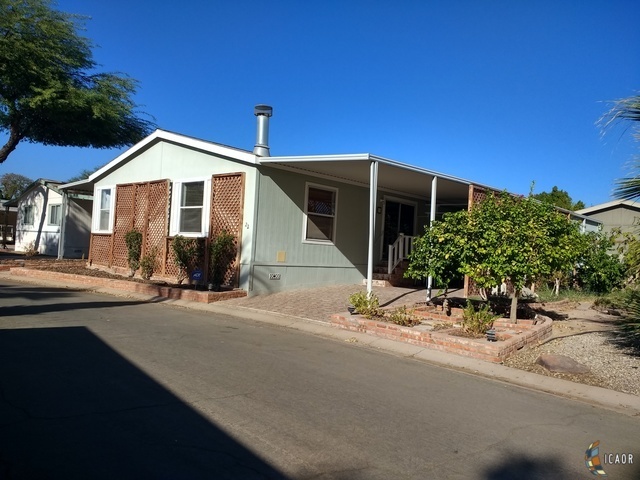 Has sidewalk at sides, back, and garden, the property has fruit trees, A storage shed 10&apos; X 20&apos;, and Earthquake bracing piers, included in the sale is the Refrigerator, stove, washer, dryer, dishwasher, dining table w/ hutch, living room set w/TV, water softener, A/C is 3 years old.